Get the NFPA 99 training you need -- in your own time frame -- with the interactive NFPA 99 Online Training Series. The U.S. Centers for Medicare & Medicaid Services (CMS) has officially adopted the 2012 edition of NFPA 99: Health Care Facilities Code. The 2012 edition of the Code has been significantly revised from previous editions. Learn how the Code is organized, understand the application of the Code to existing facilities and systems, and identify the requirements for gas and vacuum as well as electrical systems through this NFPA® Online Training Series based on the 2012 edition of NFPA 99. Whether you're a health care facility manager, involved with medical gas and vacuum systems, or responsible for electrical systems, you'll find the NFPA 99 training you need for job success in a self-paced series developed by the Code experts. NFPA provides the industry's best training in a flexible, affordable, and relevant format. Based on the 2012 edition of NFPA 99, four modules help you identify specific requirements applicable to your work. First, take the General Requirements Online Training Course for a solid introduction into the scope and structure of NFPA 99. Then, choose from courses geared toward the specific responsibilities of facility managers, medical gas and vacuum system designers and engineers, and electrical system designers and engineers. All courses offer a rich, interactive training experience, with exercises and job aids that allow practice and reinforce learning, so you're ready to apply concepts on the job. Each one-hour course ends with an exam to test your knowledge. Complete this four-hour course series and qualify for 0.4 CEUs. Completion of each individual one-hour course qualifies you for 0.1 CEU. Upon successful completion of a course or the course series, participants will be prompted to download the CEU certificate directly from the course site. See the big picture on the 2012 edition of NFPA 99 for health care facilities with the self-guided NFPA 99 General Requirements Online Training Course. The U.S. Centers for Medicare & Medicaid Services (CMS) has officially adopted the 2012 edition of NFPA 99: Health Care Facilities Code. The 2012 edition of the Code has been significantly revised from previous editions. 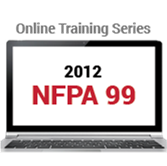 Gain essential job knowledge through this self-paced course in the NFPA 99 Online Training Series. Presented in a flexible and interactive format, the NFPA 99 General Requirements Online Training Course provides a solid overview of the Code's scope and structure, so you can navigate with ease. It's an ideal starting point for anyone who needs to access, understand, and apply provisions in the 2012 edition of NFPA 99. Facility managers will learn about how Code affects many of the systems in health care facilities. Designers and engineers for medical gas and vacuum systems and electrical systems will understand the basic application and arrangement of Code requirements, which is essential for designing safe, compliant systems. The one-hour course ends with an exam to test your knowledge. Complete this one-hour course and qualify for 0.1 CEU. Completion of each individual one-hour course qualifies you for 0.1 CEU. Upon successful completion of a course, participants will be prompted to download the CEU certificate directly from the course site. Learn how the 2012 edition of NFPA 99 applies to your existing health care facility with the self-guided NFPA 99 for Facility Managers Online Training Course. As a health care facility manager, you are responsible for compliance with NFPA 99: Health Care Facilities Code. Make sure you can confidently identify the Code requirements that apply to your existing facilities and systems, with online Code training developed specifically for your area of authority and job function. NFPA®'s self-guided NFPA 99 for Facility Managers Online Training Course is geared to the unique needs and concerns of today's health care facility managers and directors. The flexible and interactive format lets you work at your own pace to gain familiarity with the risk-based 2012 edition of NFPA 99, its scope and structure, and the provisions you are expected to apply on the job. The one-hour course ends with an exam to test your knowledge. Design and install systems for safety and compliance with the 2012 edition of NFPA 99. Take the self-guided NFPA 99 Medical Gas and Vacuum Systems Online Training Course. Patient safety and care demand a clear understanding of medical gas and vacuum system compliance as covered in Chapter 5 in the 2012 edition of NFPA 99: Health Care Facilities Code. That's why NFPA®'s Medical Gas and Vacuum Systems Online Training Course is an essential introduction or refresher for anyone responsible for system design or installation in any health care facility. Working at your own pace to review applicable requirements, you'll improve your ability ensure systems are in conformance to the Code and able to function as intended, without added risk to patients, staff, or the facility. A flexible, interactive format makes it easy to schedule training on your own time. The one-hour course ends with an exam to test your knowledge. Learn how requirements in the 2012 edition of NFPA 99 provide safe electrical performance in health care facilities. Anyone who designs or installs electrical systems in health care facilities must correctly implement requirements from NFPA 99: Health Care Facilities Code. Improve your understanding of this vital code with the NFPA 99 Electrical Systems for Health Care Facilities Online Training Course. This interactive program explains how the 2012 edition of NFPA 99 ensures reliable systems and provides for the safety of patients, staff, and facilities. Built around Chapter 6 in NFPA 99, it's an essential introduction or refresher for anyone responsible for electrical system design or installation in any health care facility. Working at your own pace, you'll improve your understanding of requirements governing the performance of all types of electrical systems in the health care environment. The flexible, interactive format makes it easy to schedule training on your own time. The one-hour course ends with an exam to test your knowledge.